This morning when I woke, up, I had the scent of cinnamon in my nose for some reason. I hadn't been baking anything with cinnamon, but perhaps it was some remnant from a dream about baking. At any rate, I decided to pull out this old recipe that I haven't baked in forever. It's been so long, I don't even remember where I got it. All I know is that it's on my "recipe ring"containing recipes that I collected sometime in high school or college, recipes that are from my grandma, church friends, and family friends (see Carol's Crescent Goodie Rolls, Grandma Schmidt's Coffee Cake, and Shakespeare Oatmeal Cookies). I'm not quite sure where this recipe comes from, though. I have vague memories of seeing it in a magazine and copying it out of there. It's been a loooong time also since I've baked anything special for breakfast on a Saturday morning, so my husband was quite pleased to have something home baked and yummy when he got up this morning. These are simple little breakfast or brunch treat, the ingredients for which most baking people always have on hand. They didn't take much time or energy at all, and are well worth the small amount of work that went into baking them. They sort of remind me of donut holes of the cake donut variety. Only, instead of a greasy layer between the donut and the coating, you get a buttery layer. Be careful you don't bake these too long. The original recipe said to bake them for 20 minutes. I checked my first batch at 17 minutes, and they were already way over-baked. Twelve minutes was perfect for me, AND I had added more batter to the pans with the second batch because the first batch just barely rose above the pan edge. At any rate, don't over bake them. Now I'm off to start fixing some Cheesecake Factory White Chicken Chili for dinner. It's going to be a delicious day. Preheat oven to 375 degrees Fahrenheit. Spray mini muffin pans with non-stick cooking spray. Beat butter and 1/2 cup sugar; beat in egg. Sift together the flour, baking powder, salt, and nutmeg. Stir dry ingredients into butter/sugar/egg mixture, alternating with the milk and buttermilk. Blend thoroughly, be careful not to over mix. Scoop batter into a zip top bag. Snip off a 1/2 inch of one corner and squeeze batter into greased muffin tin, filling each cup about 2/3 of the way up. 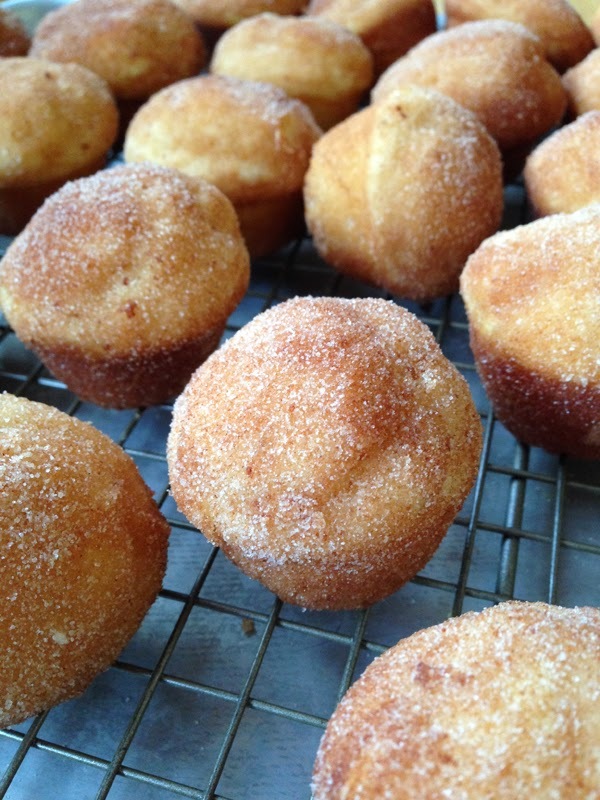 Bake at 375 degrees for about 12-13 minutes, or until a toothpick inserted into the center of a muffin comes out clean. 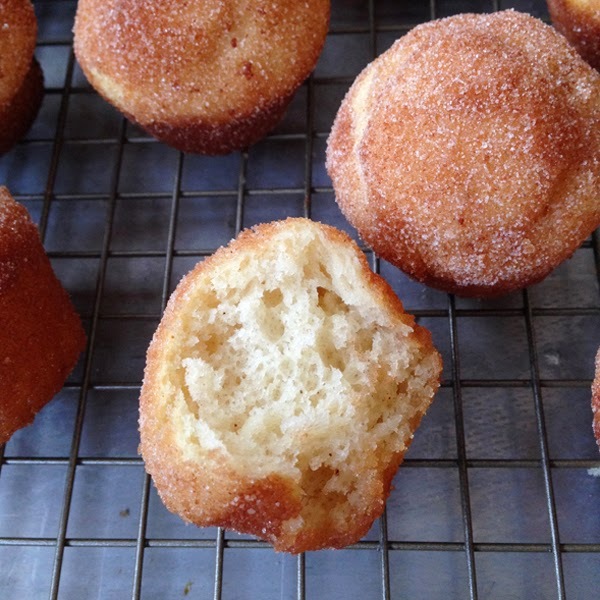 While muffins bake, melt butter and get cinnamon sugar ready. When muffins are done and have cooled in the pan for about five minutes, turn out onto a baking sheet. Then one at a time, roll tops and sides of muffins, then toss in cinnamon sugar to coat. Makes about 3 dozen mini muffins.